Also my mom now has a huge garden and grows that arugula and it is peppery as all hell and my favorite thing. My ongoing quest to be as lazy as possible when it comes to cooking was aided greatly last year with the gift of an Instant Pot. One of my staples recipes in the pressure cooker has been crack chicken (just dump in some chicken breasts and add some cream cheese to help it cook and maybe a dried ranch packet to give it flavor) which is a pretty great way to get some delicious chicken. But it's not really a meal until there are some side dishes, right? And cooking those side dishes means extra prep time and extra cleanup. That violates the goal of lazy cooking. So tonight I decided to just cook crack chicken and just dump canned corn and frozen broccoli in the pressure cooker alongside the normal ingredients. And it turns out that it all cooks together wonderfully! The resulting dish was essentially a creamy casserole with chicken, corn, and broccoli. I'll definitely be cooking this again in the not-too-distant future. 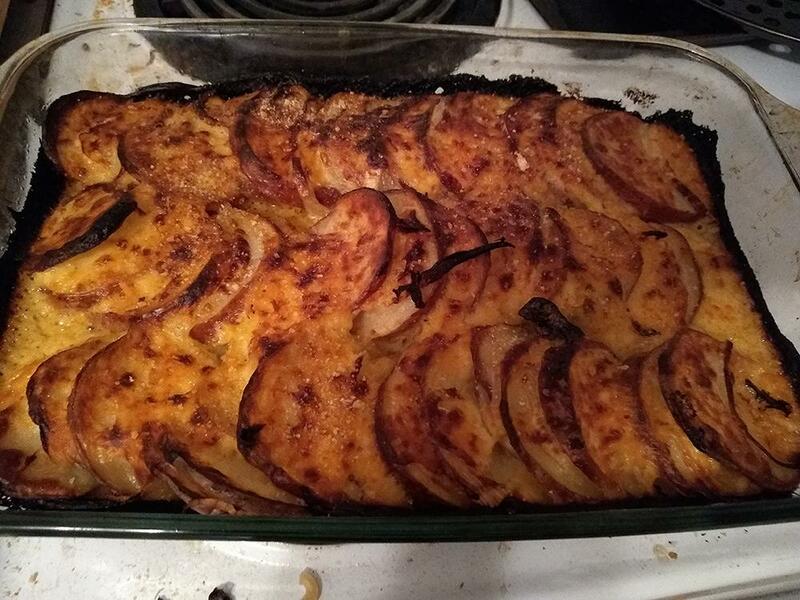 Found a nice gruyere on for half-price at the grocery store and made my first pass at potatoes au gratin. It turned out pretty good! I should know better than to check this thread before dinner, now I want those potatoes. Bad news, Kirin: I made it again today and it was even better.